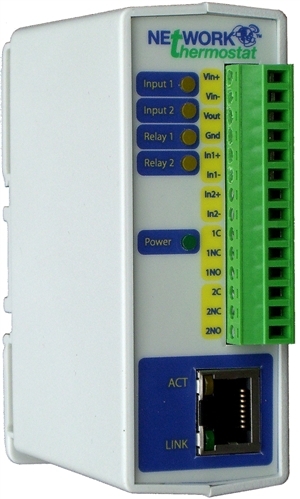 The NT-RELAY is an Ethernet based, high performance communicating relay module that has two electro-mechanical relays, two optically isolated digital inputs, non-volatile memory and a real-time clock/calendar for full scheduling. The NT-RELAY includes its own built-in web server, allowing it to be used as a stand-alone device, using a standard browser. It can also be used with the NetX™ Command Center PC software, allowing simple point and click status, control and scheduling in the familiar software environment. The two digital inputs are associated with the two relays, allowing external alarms, photocells and switches to be used as inputs to trigger the relays in addition to the built in scheduling. A reference voltage is also supplied for the inputs, allowing for simple connections for most applications.